Frankly, this movie has enough little tributes and gags in it to fuel this column for a year. 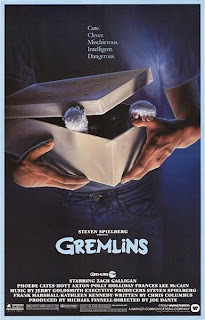 So I'll restrain myself and zero in on a few specific bits as director Joe Dante uses the setting of a movie theater to reference both his own career history and that of his illustrious executive producer Steven Spielberg in Gremlins. Those two movies are the working titles for two of Spielberg's most revered films: E.T. the Extra-Terrestrial and Close Encounters of the Third Kind, respectively. 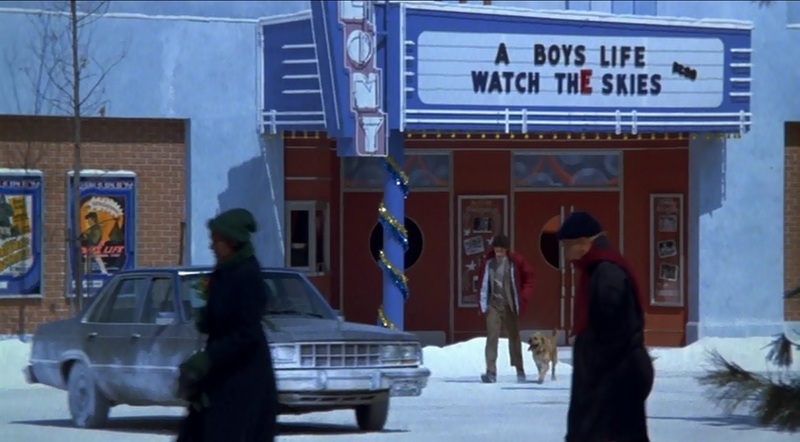 Just to the left of the entrance you can see a mock-up poster for "A Boy's Life" that might be also referencing Spielberg's short film Amblin', for which he named his production company, but it's so small in the frame it's hard to be sure. 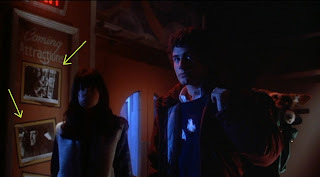 Later in the film, Billy and his girlfriend Kate (Phoebe Cates) go into the theater to deal with the title monsters, who have gathered inside. 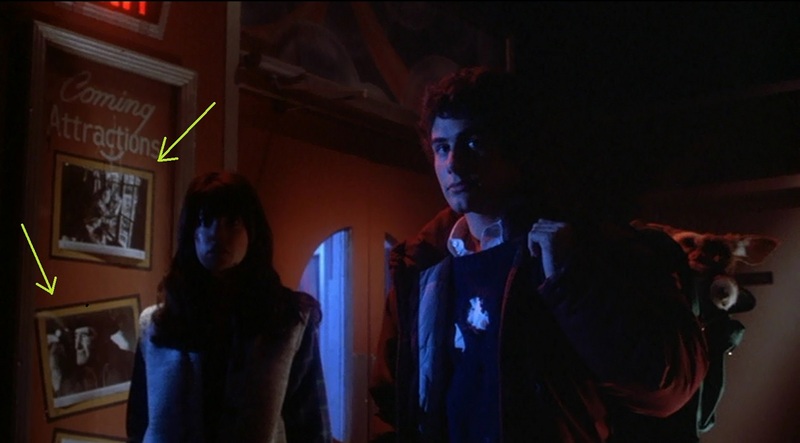 Behind them, we can see lobby cards for Joe Dante's break-out hit The Howling. You can clearly recognize the unmistakable visage of veteran horror actor John Carradine in one of the pictures. 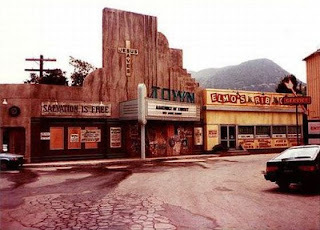 Here's one more detail: the set used for the center of Kingston Falls is the same Universal Studios backlot used for the center of Hill Valley in another Amblin-produced film, Back to the Future. 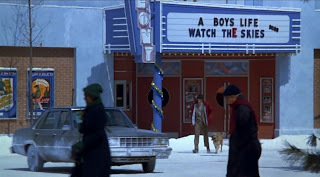 In fact the theater is the very same theater that Marty McFly crashes the time-traveling DeLorean into. And for a bit more fun and because I can't find a sharp enough picture to show it off here, here's a homework assignment: if you have the opportunity to look at a full-size version of the original movie poster of Gremlins posted at the top of this post, check out the design of the button on Billy's jeans and see if it looks familiar.